As a commercial roofing company in the Pocono’s and Stroudsburg areas, we have seen a lot of issues with previously installed roofing. Sure, when you get in touch with us asking about a roofing inspection, a roofing estimate, or even just a questions about your current roofing situation, we expect to find some issues — but sometimes the commercial roofing issues that we see are downright terrible. 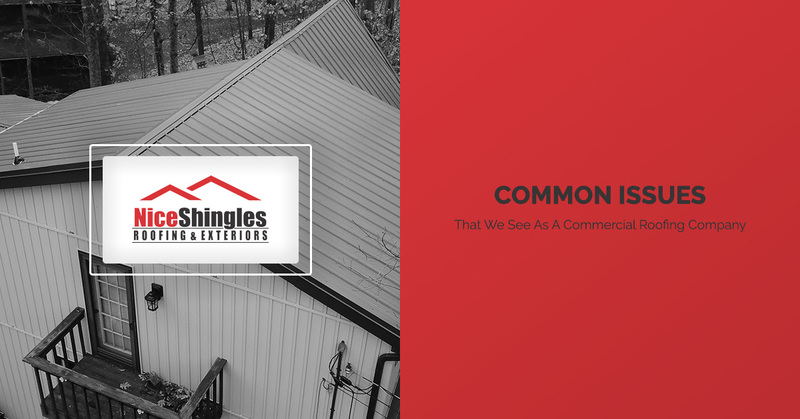 When you schedule a roof replacement, roof ventilation, or even a roofing inspection with Nice Shingles Roofing & Exteriors, you can rest easy knowing that we will work tirelessly to fix, or install, the roof of your building properly. But what are the most common types of commercial roofing issues that we see? Flashing is installed on every roof to protect walls, curbs, seams, and pipes from leaks. In fact, over 90 percent of leaky roofs are caused by faulty flashing installation or damaged flashing. But aside from human error, how can flashing fail? One of the most common reasons that we see flashing fail here in the Stroudsburg and Pocono’s areas is because of water freezing and expanding. Sure, flashing’s job is to keep water out, but a simple gap or crack in the seal can allow for water to get in. After the water freezes, expands and then melts a couple of times, the flashing will be loose — making it susceptible to further damage. If roofing materials are not properly installed, they can become susceptible to uplift from wind. Being that most commercial properties are taller than residential properties, the amount of wind resistance and uplift pressure that is exerted on the roof is exponential. When we see damage from uplift, we know that the installation was not done properly — but luckily we can fix it. Commercial roof punctures can occur for a number of reasons. For metal roofing systems and shingle roofing systems, the most common punctures are caused by falling or flying objects. Tree limbs falling in a storm, and objects lifted by wind can easily cause a puncture if they impact a roof at the correct angle. Luckily, our commercial roofing company has plenty of experience performing repairs and roof replacements — meaning that we can get your commercial building back to normal before further (internal) damages are sustained to your building. At Nice Shingles Roofing & Exteriors, we provide the people of the Stroudsburg and Pocono’s areas with unmatched roof repair and roof replacement services. Are you having trouble believing us? Just check out what one of our many happy customers have had to say about our services. We are happy to provide our customers like Tammy with the highest of quality services — because nobody should have to worry about their roof and if it was installed or fixed properly. In addition to residential and commercial roofing services, we also work with siding and gutters — making Nice Shingles Roofing & Exteriors your one-stop-shop for your home exterior needs. Contact us today to schedule an inspection or to request an estimate.